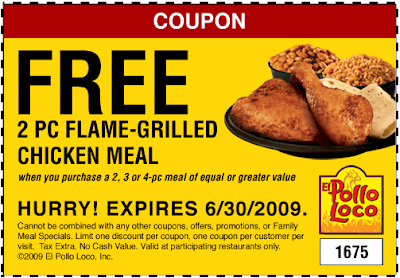 More great coupons from El Pollo Loco - one of our favorite local chains. El Pollo Loco is giving away free 2 PC flame-grilled chicken meals when you purchase a 2 PC + meal of greater or equal value. The coupon expires 6/30/09, so you have a few weeks left to use it. Could be that thrifty part of a nice evening with friends or a date. Be sure to tell your friends about this one. Somebody's gonna love you for it. And we're all gonna save cash and eat good. ;) Thanks and Enjoy!